Last summer, I participated in IIASA’s Young Scientist Summer Program, working with the Mitigation of Air Pollution and Greenhouse Gases and Ecosystems Services and Management programs. My research focused on what impacts the EU climate and air quality policy could have on ground level ozone around the middle of this century. While clean air policies should help reduce the pollution that can lead to ozone formation, we found that that climate change and energy policies will still increase ozone concentrations and damage by mid-century, unless stricter air pollution measures are implemented. Ozone at ground level is an air pollutant, causing health and ecosystem problems. It is also an important component of summer smog. Ozone is not emitted into the atmosphere directly, but is produced when volatile organic carbons are oxidized in the presence of nitrogen oxides and light. Nitrogen oxides are released into the atmosphere mainly as a result of combustion processes (like car engines and industry), while non-methane volatile organic carbons (NMVOCs) come in large part from vegetation, especially broad-leaf trees and some fast-growing crops. Part of the EU energy policy is to stimulate the use of sustainable biomass as an energy source. This could lead to expansion of commercial bioenergy crop production in plantations and an increasing use of forests. While this may help to reduce greenhouse gas emissions, it will also increase NMVOC emissions. At the same time, EU air quality policies aim to reduce emissions of air pollutants such as nitrogen oxides and man-made NMVOC. Because some steps in the ground level ozone formation process are driven by absorption of light and/or proceed faster with higher temperatures, climate change could lead to higher ground level ozone concentrations in the future. The separate effects of these three trends on ground level ozone have been studied before, but the question remains: what will be the combined impact of a) an increase of bioenergy plantations, b) EU’s air quality policy and c) climate change on health and ecosystem damage from ground level ozone? And which of the trends is the most important? To answer these questions, I used three models to study two energy and air quality scenarios for Europe under current and possible future climate conditions. Two energy scenarios calculated by the Price-Induced Market Equilibrium System (PRIMES) model form the basis of this work. We used a reference scenario and one in which Europe reaches 80% CO2 emission reduction in 2050. These energy scenarios were used as a basis to calculate air pollutant emissions with IIASA’s Greenhouse Gas and Air Pollution Interactions and Synergies (GAINS) model. Then we put the same scenarios into IIASA’s Global Biosphere Model GLOBIOM to obtain the change in land cover because of increasing bioenergy demand. 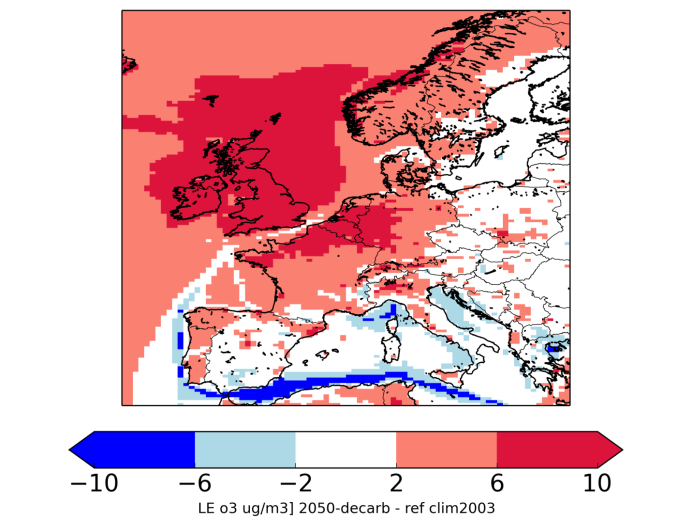 I combined these datasets in chemistry transport model LOTOS-EUROS (the model of choice at my home institute, TNO) to calculate the impact on ground level ozone concentrations across Europe. To simulate ‘future climate’ we used the year 2003, in which Europe had a very warm summer, with temperatures 2-5 °C higher than normal. Difference in average ozone concentration (in µg/m3) between the current situation and the 80% CO2 reduction scenario in 2050 under future climate change conditions for the period April-September. Negative numbers mean a decrease in ozone levels. We found that especially for the CO2-reduction scenario, the increase in bioenergy production could cause a slight increase in ozone damage. However, the impact of reduced emissions because of more stringent air quality policies far outweighs this effect, leading to a net reduction of ozone damage. The third effect, more efficient ozone formation in a warming climate, is so strong that in 2050 ozone damage to human health could be worse than today, especially for northwestern Europe. 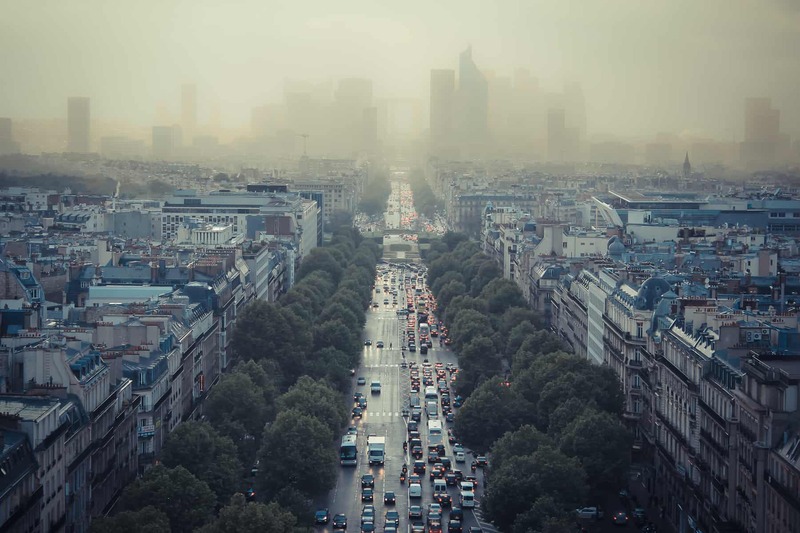 Stringent air quality policies close to a maximum feasible reduction scenario would be needed to make sure that health and ecosystem damage towards the middle of the century is smaller than it is today.